Everyone knows the dangers of safety-sensitive areas in the workplace, in most cases accidents can be prevented, but no one can foresee a disaster that is related to drug abuse. Theft, lower productivity, absenteeism can also be reduced. As a result, companies are finding it ever more critical to drug test their employees. As a result, employing a “no to drugs” policy will reduce insurance and workers comp premiums. Managers are finding adopting a drug-free workplace policy minimizes the burden to the bottom line and increases profitability. ○ Do you have a drug-free workplace program in place? Drug testing is only one component of a comprehensive drug-free workplace program. What you need is a written policy that clearly outlines the employer expectations regarding drug use. Train your supervisors on the signs and symptoms of drug use and their role in enforcing the policy. Educate your employees about the dangers of drug abuse. Finally, provide counseling and referral services to employees struggling with drug problems with an Employee Assistance Program (EAP). ○ Policy and procedures for a drug-free workplace. A comprehensive drug-free workplace program contributes to a workplace free of the health, safety and productivity hazards caused by employees’ abuse of alcohol or drugs. By educating employees about the dangers of alcohol and drug abuse and encouraging individuals with related problems to seek help, employers can protect their businesses from such hazards, retain valuable employees and help play a part in making communities safer and healthier. The Department of Labor’s online Drug-Free Workplace Program has some handy tools to help employers develop a customized drug-free workplace policy. You can review different components of a comprehensive plan and then generate a written policy statement based on your responses to pre-set questions and comments. Most managers seek legal consultation before commencing a drug testing program. Our goal is to help you limit your exposure to liability by providing some help for a drug-free workplace. Starting up your “in-house” testing as opposed using “third part collector” (labs) can be so much more affordable and thus accessible to get going. There is plenty of help from government websites with sample policies and advice. A drug-free workplace can help you the employer create a cost-effective, safe, and healthy environment for every employee while saving costs and putting profit back on the bottom line. Drug-free workplace programs range from basic to comprehensive. The size of the organization, the nature of the workforce, and the resources available will affect your decisions. Supervisors who assess their workplace can determine which components are practical and beneficial; they tailor the policy to suit their business needs. The manager who writes written policies helps employees understand its content. Provide training for all employees, tell them what it’s all about. Furthermore, explain the procedures for reporting suspicion, accidents, and theft. Finally, tell them why you are implementing a drug testing program. Employees that object to working in a drug-free workplace to their supervisor should raise a red flag. Download and Print Drug-Free workplace policy. ○ Workplace drug test kits. Companies avoid the dangers of drug abuse in the workplace with “Drug Testing Kits.” Supervisors find it easy to manage and administer drug testing when they follow the information on this page. 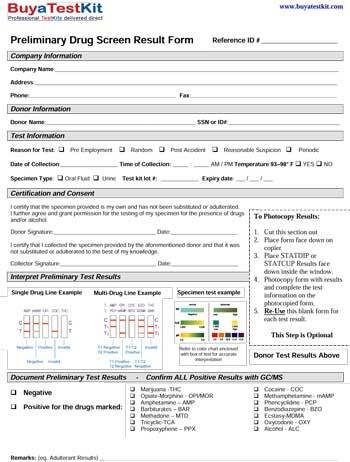 Supervisors also use the information on our solutions pages to help maintain their workplace drug testing program. The most common types of tests employers use are five (5) and ten (10) panel tests. These detect either five or ten drugs, the difference in price is not very much. Managers can refer to Department of Transport website to help decide what drugs need to be tested. Federally Mandated Organisations test for the following: Cocaine, Opiates, Amphetamines, Methamphetamine, Ecstasy, Phencyclidine, Hydromorphone, Hydrocodone, and Marijuana. Customers often use this as a starting point, but you may want to add additional tests such as Benzodiazepines and Oxycodone to the test. Whatever you decide, we have what you need. Workplace Drug Testing kits are the perfect solution for employers. Drug testing packages include the tools you need to operate and maintain on-site drug testing. It will determine if your employees or job applicants are using drugs and can identify evidence of recent use of prescription and illicit drugs too. Each pack includes full instructions so you can test with confidence and have an affordable, fully managed, drug testing regime at your place of business. We have other tools to help you achieve testing with confidence. In conclusion, drug and alcohol abuse is a severe problem in the workplace. I know what you are saying “Nobody is abusing drugs in my business.” There are plenty of statistics that say the contrary! ○ How to process a drug test? Drug testing requires an administrator to document the process with a chain-of-custody form or testing record document. It documents the handling and storage of the employee’s sample from the time of collection to the time of completion. Correctly documenting the individual’s sample throughout testing is proof of the process. The first analysis is called a drug screen using a rapid drug testing assay; a confirmatory test will be required if the first analysis is a presumed positive. The supervisor will send the presumed positive sample to a SAMHSA approved laboratory. The laboratory will test the sample with a technique called Gas Chromatography/Mass Spectrometry. The test is highly accurate and provides specificity to help rule out any false positives from the initial drug screen. If a drug test is confirmed positive, a licensed Medical Review Officer (MRO); a doctor who has specialized training in the area of substance abuse, should then review the results. They will contact the individual directly to ascertain reasons for the positive test. Because, if this is the case, and a doctor prescribed the medicine, then the test will be reported as negative. The Medical Review Officer will then say this to the employer. Consequently, it is essential to use the services of a Medical Review Officer to act as an intermediary. Furthermore, the process smooths out irregularities and removes potential legal implications between employee and company. ○ What are the reasons employers implement drug testing? Comply with State laws or Federal regulations. To prevent employing an individual who abuses drugs the HR department will generally ask an applicant to take a drug test before full employment. Applicants agree to be tested as a condition of work if they fail to produce a negative test. Supervisors often justify drug testing when an employee shows signs of unusual behavior. A manager may ask them as probable-cause or reasonable suspicion. Supervisors document visible signs and symptoms that lead them to suspect drug use. It is essential to have precise, consistent definitions of what behavior justifies drug testing. Another supervisor or manager should corroborate their behavior. Since this type of testing is at the discretion of management, it requires careful, comprehensive supervisor training. Employees who are suspected of drug use or violate policy should not return to work while awaiting the results of a reasonable suspicion test. Customers often use a Reasonable Suspicion checklist to help with assessing employees. You can download your copy of the Checklist. Since property damage or personal injury may result from accidents, drug testing after an accident can help determine whether drugs were a factor. Although the results of a post-accident test may assess drug use, a positive test result cannot prove that drug use caused the accident. Test the employee as soon as practically possible. Most of all it is recommended that post-accident drug testing is completed within 2 hours of the incident. Finally, employees should not be allowed to return to work until the final test result is complete. Managers randomly test employees on an unannounced basis. They set up a random testing pool taking their social security or employee number for identification purposes and wait for their computer generated selection. As a result, each employee is randomly selected from the workforce and has an equal chance of being selected for testing. Managers will set up periodic testing, usually scheduled in advance, but depending on the nature of employment could be quarterly, half yearly or yearly. Employees generally accepted this process, but, employees can prepare themselves by abstaining from drug use several days beforehand to avoid detection. ○ The drug testing methodology. There are two standard methods to research. Urine: Results of a urine test show the presence or absence of drug metabolites in a person’s urine. They remain in the body for some time after the effects of a drug have worn off. It detects the use of a particular drug within the previous few days. ○ How is a positive determined? Manufacturers set their test kits to detect the presence or amount of a drug found in a sample to a specified level. If a drug or its metabolite exceeds that level, then the result is positive. Its known as the cut-off level. Drug test kits with FDA clearance adhere to these levels, so you do not need to be concerned. Substance-abusing employees function at about 67% of their capacity. Employers who drug test their employees have experienced over 50% reduction in workplace injury rates within two years of implementing a drug testing program. Disclaimer: This page is provided for informational purposes only and should not be relied upon as legal advice. The reader retains the full responsibility to ensure compliance with all applicable laws relative to drug testing.